Active Angels In Home Health Care, LLC may not be a huge company. We are relatively medium sized but our hearts are big and our willingness to help surpasses any commitment barometer. The passion we put into our work cannot be measured and we are proud to be serving the home-bound, the disabled and the elderly in the privacy of their homes. The business office of Active Angels In Home Health Care, LLC is located in Ferguson. We serve the needs of home health care eligible residents in the St. Louis City, St. Louis and St. Charles counties. Through the VetAssist Program veterans or their surviving spouses can be eligible for home health care services. For more information on VetAssist Program please go to our resource tab to find the link to their website. Active Angels provides medicaid covered services under DHSS Healthy Children and & Youth Program (HCY). This service provides medically necessary care approved by a doctor to any persons beginning with new born (2-3 days old) up to 20 years old. Consumer Directive Services (CDS) is a medicaid program that allows anyone who is eligible for personal care services and capable of self directing to hire a personal caregiver. Giving family members the opportunity to get paid for servicing a loved one. With our private duty contract we offer a variety of services and allow for clients to customize the care they would like to receive. Private duty services does require of a minimum of 4 hours a day and the signing of the contract prior to receiving services, please call the office for additional details. Nursing procedures are performed in the comfort and safety of the clients’ homes. Our registered nurses and nursing assistants will be tasked to administer procedures that are necessary to preserve the health of clients who are recovering at home or continuing their treatment as out-patients. No care plan is duplicated – just as no client is a duplicate of another. 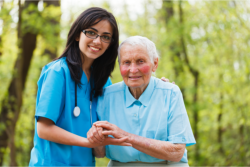 We customize our care plans at Active Angels In Home Health Care, LLC. These care plans are then put into action by our home health aides.